NEW YORK (AP) Miami pitcher Dan Straily has been suspended for five games for intentionally throwing a pitch at San Francisco’s Buster Posey while warnings were in place for both teams. On Tuesday night in the Marlins’ 6-3 loss in San Francisco, Straily and Mattingly were automatically ejected in the second inning after Straily hit Posey on the left arm with a pitch. 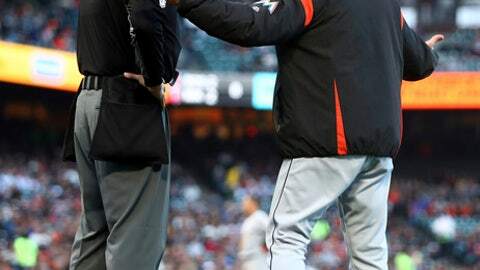 Both sides had been warned by plate umpire Andy Fletcher the previous inning after Giants rookie starter Dereck Rodriguez beaned Lewis Brinson as tempers flared for the second straight game. Posey had homered in the first inning.